What can lower the body’s supply of iron? Who is most likely to develop iron deficiency? THIS PRODUCT IS NOT INTENDED TO DIAGNOSE, TREAT, CURE, OR PREVENT ANY DISEASE. 1. AAFP. Iron Deficiency Anemia: Evaluation and Management. Issues. Website. http://www.aafp.org/afp/2013/0115/p98.html#afp20130115p98-b15. Reviewed January 15, 2013. Accessed February 2, 2017. 2. Mayo Clinic. Diseases and Conditions, Iron deficiency anemia. Reviewed November 11, 2016. Accessed January 31, 2017. Website. http://www.mayoclinic.org/diseases-conditions/iron-deficiency-anemia/symptoms-causes/syc-20355034. 3. Scholl TO. Maternal Iron Status: Relation to fetal growth, length of gestation and the neonate’s endowment. Nutrition Reviews. 2011;69(Suppl 1):S23-S29. doi:10.1111/j.1753-4887.2011.00429.x. 4. Mayo Clinic. Anemia. Patient Care and Health Information. Reviewed August 6, 2016. Accessed January 31, 2017. Website. http://www.mayoclinic.org/diseases-conditions/anemia/symptoms-causes/dxc-20183157. *Most eligible patients will pay no more than $30 per copay. 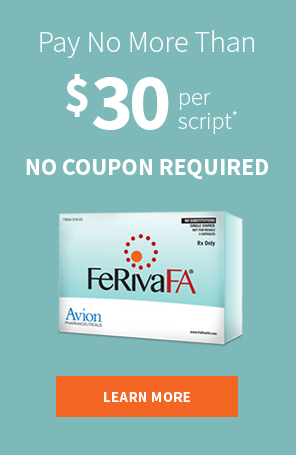 For each FeRivaFA® prescription, pay the first $30 of your out-of-pocket expense and FeRivaFA® will cover up to $60 of your remaining expense. You could have additional responsibility depending on your insurance plan or remaining expense. This offer is good for 12 uses. FeRivaFA® is a registered trademark of Avion Pharmaceuticals, LLC, all rights reserved. Sumalate® is a registered trademark of Albion Laboratories, Inc. covered by one or more claims of U.S. Patent Nos. 6,716,814; 8,007,846; and 8,425,956. Ferrochel® is a registered trademark of Albion Laboratories, Inc. covered by U.S. Patents 6,716,814 & 7,838,042. FeRivaFA® contains L-methylfolate calcium. The L-methylfolate ([6S]-N5-methyltetrahydrofolic acid calcium salt) in FeRivaFA® is less than 1.0% D-isomer. INDICATIONS: FeRiva FA® is a multivitamin/multimineral dietary supplement indicated for use in improving the nutritional status of patients with iron deficiency. CONTRAINDICATIONS: FeRiva FA® is contraindicated in patients with a known hypersensitivity to any of the ingredients. Hemochromatosis and hemosiderosis are contraindicated to iron therapy. PRECAUTIONS: Folic acid alone is improper therapy in the treatment of pernicious anemia and other megaloblastic anemias where Vitamin B12 is deficient. Folic acid in doses above 1.0 mg daily may obscure pernicious anemia in that hematologic remission can occur while neurological manifestations progress. While prescribing this nutritional supplement for pregnant women, nursing mothers or for women prior to conception, their medical condition and other drugs, herbs and/or supplements consumption should be considered. PEDIATRIC USE: Safety and effectiveness have not been studied in pediatric patients. DOSAGE AND ADMINISTRATION: Adults, one (1) capsule daily, with or without food, or as prescribed by your healthcare provider. Do not administer to children under the age of 12. HOW SUPPLIED: In child-resistant bottles of 30 capsules (75854-319-30). The listed product number is not a National Drug Code, but has instead been formatted to comply with standard industry practice for pharmacy computer systems. THESE STATEMENTS HAVE NOT BEEN EVALUATED BY THE FOOD AND DRUG ADMINISTRATION. THIS PRODUCT IS NOT INTENDED TO DIAGNOSE, TREAT, CURE OR PREVENT ANY DISEASE. KEEP THIS AND ALL MEDICATIONS OUT OF THE REACH OF CHILDREN.